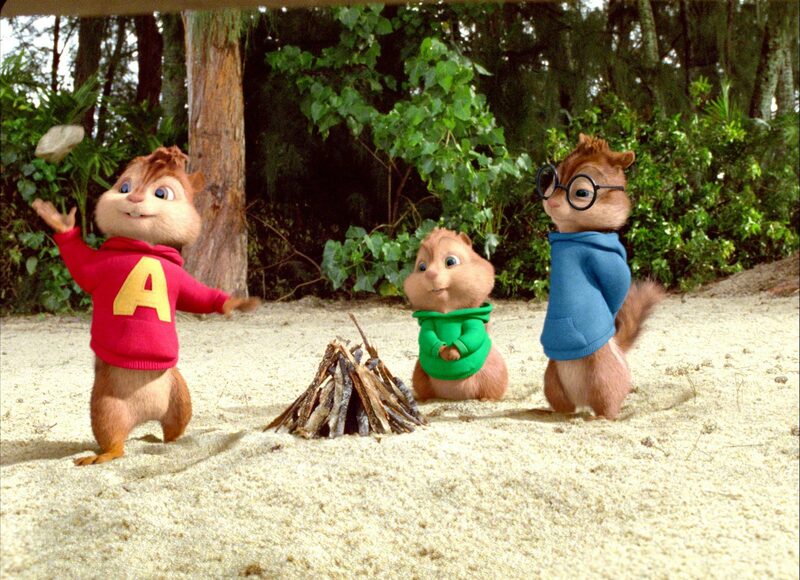 One of the more difficult videos to watch on the Internet is the full-length trailer for Alvin and the Chipmunks 3: Chipwrecked. Most viewers over the age of six will find it tough to get further than 47 seconds into the video, when the lady chipmunks (The Chipettes) start singing Whip My Hair. It seems unlikely that the film will ever be watched by any adult unless in the presence of minors, and even then, the endeavour would be a struggle. From the trailer, Chipwrecked looks insipid, hollow, and as if you’d shed brain cells just be being in the same room as it. Bearing that in mind, I decided to accept the invitation I received to a screening of the film, despite the distinct absence of children in my life and possessing some semblance of taste. A bad film can be far more enjoyable than a good one, but Chipwrecked doesn’t fall into that category. It isn’t a folly of ambition, where a good concept was derailed by bad choices, or where elements simply didn’t click. That at least would be watchable, and worthy of discussion. The problem with Chipwrecked isn’t that it’s awful, but that it’s competent. The film is a mediocrity, and deliberately so: it’s entertainment designed to keep children with low standards occupied for an hour and a bit, and nothing more. If Sony could get people to come to a still image of Alvin and his chipmunk brethren with the words “Quiet down now” written beneath, then presumably they would. And that’s okay. Pixar and Studio Ghibli continue to make films, and continue to be commercially successful, so children are still getting the magic they need. When you’re stranded in it, childhood is infinitely boring and pretty endless: not every film can be WALL-E, and there’s a market for something that will literally just pass the time. Children need to have their time passed, because they have so much of it. Chipwrecked isn’t an insidious film by any means, it’s just one that any rational human would only watch with 6-year-old cousins, on a wet Saturday, under duress. What is notable about the film (and it’s just about the only thing that is notable about it) is its non-rodent cast list. Someone who isn’t an aficionado of the sizeable, baffling series might be surprised to see comedian David Cross star as the chipmunks’ arch-nemesis, Ian. Best known for playing Tobias Fünke in Arrested Development and for his acerbic stand-up, Cross is an unlikely choice for the series, and Chipwrecked is exactly the opposite sort of film you’d expect him to be in. Unsurprisingly, when Cross appeared in the first film he was crucified by cultural commentators and across the internet, leading him to write a lengthy blog post defending his right to appear in a kid’s film solely for the money. The non-controversy raged on for a while and eventually dissipated, supplanted by something else. Now as the third film appears no-one has taken any notice at all, and even Cross’ fans probably have no idea he’s continuing to star in the series. It’s understandable: a film like Chipwrecked is cultural white noise. It basically doesn’t exist. That initial outcry is worth investigating, however, because it says less about artists and more about our desire for those artists to be unimpeachable. The high standards we hold creative people to seems hypocritical when applied to our own lives. The rest of us do jobs that we don’t like so that we can pursue things we care about, so why can’t actors? Why can’t there be a division in an actor’s work between things they do for the art and things they do for the pay check, even though both things exist in a creative medium? We may balk at a gifted comedian like Ben Stiller starring in family-friendly dross, but doing that dross allows him to appear in films like The Royal Tenenbaums or Greenberg, or to have supported a string of talented filmmakers early in their careers. Night at the Museum 2 doesn’t cancel out Flirting With Disaster. Unless an actor is exceptionally lucky it isn’t possible for them to maintain a career without taking roles just to pay the rent. Perhaps we should think of Chipwrecked as the equivalent of working in a shop. Surely it’s better for David Cross co-star in Alvin and the Chipmunks 3 than him doing admin somewhere? Admittedly that may be an arguable point, considering that Cross spends the entirety of Chipwrecked wearing an oversized pelican costume and acting opposite CGI chipmunks who insist on breaking into song every five minutes. It’s a defendable choice, however. A lot of us spend our working lives putting on oversized pelican costumes they just happen to be of the metaphorical kind. Undeniably, though, there isn’t a great deal of dignity in it. Cross did the first film because he hadn’t worked in six months and wanted to buy a cottage, but what was his excuse the second time (Alvin and the Chipmunks 2: The Squeakquel), or now? How many cottages does one man need? When is it okay to say yes? And when should you say no?